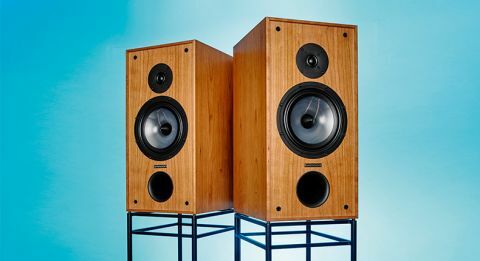 Spendor SP2/3R2 review | What Hi-Fi? For many it would be tempting to write off Spendor’s SP2/3R2 as some sort of throwback – a speaker for those with a love of retro rather than those who put performance first. That would be a mistake. Despite a design ancestry that dates back to the 1970s, there’s much this dinosaur could teach its modern competition. At 55cm high, the SP2/3R2s are massive by current standards. They need plenty of space around them too, otherwise there’s a very real danger of the bass dominating the overall balance. But, once properly positioned, these speakers have a lovely, smooth tonal sound tinged with an appealing degree of warmth. This kind of presentation has fallen out of fashion over the years in favour of a leaner, more forward attitude, which is a bit of a shame. We recommend the dedicated stands, available for an extra £525. This frame- based metal design suits the speakers perfectly, as it should, and the resultant sonic balance is good. But some of our stands’ welds aren’t very neat and one wasn’t quite square. At £500-odd, we’d be asking for a replacement pair. In contrast, the SP2/3Rs are superbly made. There are crisp edges, neat veneers and every sign of a high level of attention to detail. There’s a choice of two finishes: the cherry of our review sample and a rather nice dark walnut. Take these speakers out of the packaging and you’ll find that they don’t quite feel as rigid or heavy as expected. That’s a result of the damped, thin-wall construction used in the cabinets. It means the main cabinet resonances are at a lower frequency than usual. The big cabinet also allows the use of larger-than-usual drive units. In the SP2/3Rs’ case that means a 21cm mid/ bass that uses an EP38 Polymer cone. Its low-frequency output is tuned by a large front-facing port. Highs are delivered by Spendor’s favoured wide-surround dome tweeter. The two drivers are linked with an updated crossover. How do the SP2/3R2s sound? The large cabinet and big mid/bass drivers give these speakers a balance of qualities alien to most of the (invariably smaller) competition. Their sonic presentation is huge, delivering Hans Zimmer’s Interstellar OST with class-leading authority and scale. Lows are deep and powerful but textured with a rare delicacy. They’re rich – perhaps lacking a little grip – but dovetail into the midrange wonderfully. While these standmounters don’t go out of their way to highlight detail, you’ll find they have excellent resolution – low-level instrumental strands remain easy to follow no matter how complex the music gets. It’s all so unforced, almost relaxed but without eroding the music’s energy too much. We expect something of this size to be able to cope with large-scale dynamic swings, and the SP2/3Rs do. There’s plenty of reach here, and a refusal to harden up when pushed at high volumes. Less expected is the way these speakers handle the subtleties – the micro-dynamics that communicate the emotion in a voice or underline the skill of a musician. In this area the Spendors are superb, outstripping just about any sub-£3000 alternative we can think of. Move on to Prince’s Sign ‘O’ The Times and these speakers continue to impress. At first we fear their smooth balance and relaxed approach to rhythms will be an issue, but we come to appreciate their measured presentation. They may lose out to some on outright punch and drive, but they compensate by not making a meal of the production’s rough edges. We play a range of music from Tchaikovsky’s 1812 Overture to Bruce Springsteen’s Radio Nowhere and the SP2/3R2s never fail to please. Some alternatives sound more exciting, but we think the Spendors’ easy-going yet insightful nature has plenty of appeal. They’re the kind of speakers that leave you thinking about the quality of the music rather than grabbing your attention with sonic fireworks. That trade-off is just fine with us.